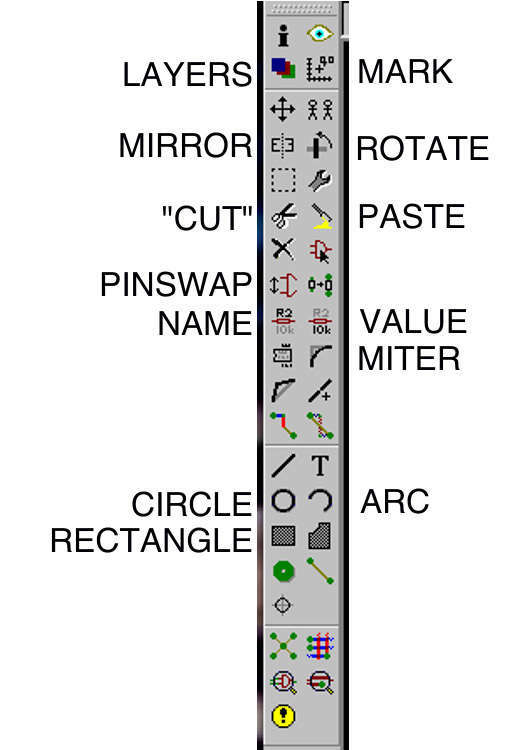 In a previous Instructable, I provided an intro to schematic entry using CadSoft's EAGLE editor. I guess I should say that we'll make a PCB DESIGN; making the physical board is a different task, and there are a lot of tutorials on the net (and even some instructables) on making the board after you have the design. So this is the schematic we have from the Schematic Instructable. Up in the file menu, there's a "Switch to board" selection. If we do that from a bare schematic, it will offer to create the board from the schematic for us (say "yes"), and then leave us sitting in the Board Editor. The Board Editor looks a lot like the schematic editor, with some different commands. GROUP Groups a collection of objects into a "group" that can be manipulated simultaneously. DELETE Delete an object. Items created in schematics need to be deleted there. SMASH Separate the text labels of a part from the part itself, so they can be moved independently. HOLE a hole that isn't associated with a signal, ie for mounting. RATSNEST recomputes airwires and polygons, eg after components have been moved. CHANGE changes an object's properties. RIPUP changes a routed trace back to an airwire. Sorta equivilent to "delete" for traces. DRC invoke the Design Rule Check and parameter setting. I'll describe the remaining icons toward the end, and assign them "useful" or "useless." Creating the PCB design consists of placing all the components in logical places, and routing all the airwires in a way that allows the design to work. The first thing we want to do is move at least some components into the legal board area where we can work with them. If you have a particularly large board with many components, you might want to do this a section at a time. For this sample board, we have plenty of room and we can move them all at once, using the group-move feature. Select the GROUP icon, then click and drag to make a rectangle that goes all the way around the components. Then select the MOVE icon and RIGHT click (right clicking selects the group instead of a single component) and drag the set into the board outline. Use the ZOOM button to tighter the view. The full legal side of the board is bigger than we need. Shrink the outline by using the MOVE tool. Click on the center of the top horizontal line (which selects the whole line instead of an endpoint) and move it down, Then click on the center of the rightmost vertical line and move it leftward. Clicking near the center of a line moves the whole line. Clicking near a vertice moves only the point. Now we need to move the components to (near) where we want them on the final board. OR we want to move them to sensible places that will make the placement of traces easier. A lot of the "ART" of making PCBs (and especially Single Sided Boards) lies in finding "good" places for the components. After the rest of the components are placed in ok-looking relative locations, I can squeeze them together again (manually, moving them one at a time; no magic command for this!) and shrink the board outline some more. So we'll load up that set of hobbyist design rules before we start laying out tracks. You can see how the design rule change has already modified the board. Pads are bigger, and they're all round. You'll also notice that one of the resistors is set as a non-vertical package, unlike the rest. This was probably an error in the schematic entry, and it didn't matter when all we had was the schematic. Now that we are making the board, we want to change the package as appropriate. There are other ways to enter a "change" command in the text command entry area that you'll want to look into if you need to change a lot of devices to a particular package, so you can skip going through the list for each one. Something like "change package 'R-US/0207/2V', and then just click on each component. Now we'll see if the autorouter can do some of the work for us. The EAGLE autorouter isn't the best in the world, but even when it does a "bad" job, it will give us some general hints on how things need to look, or where the trouble spots are. The other thing you may need to change is the routing grid. This defaults to the same default grid as the board layout editor in general: 0.05 inches (1.27mm, since I have my editor set up in metric.) Since this particular board has big parts, and we haven't moved any off the default grid, we're ok with that value. If you have SMT components or have moved things around on a finer grid, you might have pads that are not on the touing grid, which the autorouter doesn't like much ("unreachable pad", etc) You can make the grid very small, but it will take longer. IMO, it's better to start with a coarse grid and halve it each time it looks like routes fail because the grid is too large. Also note that the autorouter obeys the board dimension lines, so if you haven't moved them close to your components, you might have traces travel all over the board. Or if you've moved the outline too close to the pads, you may have prevented traces from going places they need to go. The autorouter did a pretty nice job here. There's only one trace left. There are a couple of ways we could route this signal manually, including some snakey routes between transistor pins that the autorouter didn't use because of the design rules we specified. This is a relatively high current trace, and I decided that I won't manually violate the design rules either. Instead, I'll use a jumper wire on the component side, which I can model in EAGLE as a top-side trace. Select the ROUTE tool and click on an endpoint of an unrouted (yellow) airwire, and you can position a trace pretty much anywhere you want, selecting width, layer, and type of bend from the menu bar as you go along. This is shown in the succession of pictures in this step. Now we'll repeat the process for the positive voltage. However, we never named that signal when we drew the schematic, so it will have some random name like "N$23"; We can use the "INFO" command to find the signal name to use when we draw the polygon, after which it's the same as drawing the GND polygon. In this case, the V+ signal is named n$1, so we type "poly n$1"
We can move some of the traces so they look neater, offer better clearance, etc. Also, we shrink the board to its final size ny squishing the components together some more. Step 17: Fixing an OOPS! POWER connections; there's no way to connect a battery or power supply to this circuit board. Oh sure, you can just tack some wires onto the supply polygons, but how elegant is that! We could go back to the schematic and add some actual power connectors or battery holders, but those are a bit rigid for a circuit that's probably going to be connected to a battery pack with some wires anyway. Instead, let's add some Vias to act as connection points for the power wires. While we're at it. I'll add some text to the silkscreen to show where the emitter lead of the transistors should go. Use the "text" icon button, and change the layer to tPlace. Save your work often. You've been doing that, right? admiration on web pages, review by peers, transfer to physical PCB material, and so on. One way to output the board is to "export" an image. LAYERS Adjust which layers are displayed. Boards have many more layers than schematics! MIRROR Move a component from being mounted on the top of the board to being mounted on the bottom of the board. CUT COPYS a selection, despite the name. NAME Change the name of an object. MARK Place a measurement mark. Your info area will start showing distances relative to the mark as well as to the origin. ROTATE rotate an object. This can rotate angles other than 90 degrees. PASTE Paste some objects that were previously copied with CUT. VALUE Change the value of an object. MITER make signal corners rounded. SHOW SHOW is more useful from the text command area. I think. DUPLICATE Duplicate an object. Usually done in the schematic. ADD Add a component. Usuaully done in the schematic. POLYGON more useful from the text command area. Thanks for taking the time and putting it together. Very, very helpful. There is a worse program - Fritzing! Sadly, Adafruit has even started using it. Eagle has some very Germanic characteristics, which people refer to as quirky. easiest to actually use AND allow you to do unusual things. Then you can convert them in to common PCB formats using a piece of software from Robot Room called Copper Connection PCB Editor >http://www.robotroom.com/PCBs-Breadboards.html<. I actually am involved the design of military robotics and infra-red systems and often use low-end PCB layout software rather than firing up the Credence software we also use. I am sorry you're frustrated, but you can do all the things you're complaining about. 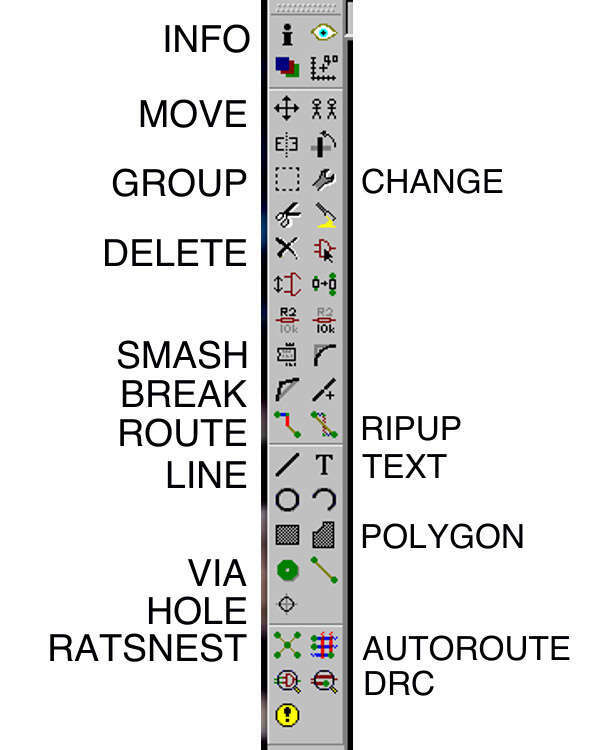 To delete traces made with "Route" use the "Ripup" function located to the right of the "Route" button. To delete traces made with "Wire" use the "Delete" function. When you place a trace with "Route" it deletes the "Unrouted" yellow line, if you put a trace with "Wire" you add a new trace and you should change it's name to the net name you wish, otherwise it's just a piece of cooper unconnected and it will give you DRC errors. You can also change the grid and resolution to whatever you want. I built boards with 6 layers and traces/gaps of 6mil and it works fine. There are a lot of tutorials about this. This instructable is really helpful. Though I have a question - If you add polygons to the PCB design it makes it multilayered right? Then how to etch the design onto a copper board? No, you can have polygons even on a single sided board. You do have to watch out for the polygon being "broken apart" by the other traces more than in a multi-layer design. Your article mentioned here and I hope to be able to reprint my personal blog: http: //pcb.ui3g.com The Printed Circuit Industries Service, Product and Resource Guide, ok? A great tutorial. If are interested in electronic circuit design, I’d like to share you with another useful tutorials https://easyeda.com/Doc/Tutorial/ it will be helpful to your study. I can't thank you enough for this excellent tutorial. I thought I'd never get the hang of it and it's not a very intuitive program. Do consider turning these tuts into a book. Now hopefully one last question : after drawing the ground plane with the ratsnest command I got a nice big plane but also a bunch of tiny little islands that serve no purpose but to make the board look dumb. I tried erasing these islands with the rip up but it just ripped up the closest vital wire instead. Is there away to zap these tiny little island ground planes ? Thanks MUCHO !! I've added text to the bRestrict using the vector font, but when I generate my gerber files, the text isn't there. Shouldn't the gerber file containing the bottom copper layer include the bRestrict layer and then show the missing copper when viewing that gerber file with the gerber viewer? It mysteriously fixed itself. Thanks. great tutorial but how do you deal with tracks present in the schematic that don't appear on the pcb layout? You have just taken me from dreading making the PCB from the schematic to having one done in a flash. Excellent instructable on taking the somewhat intimidating Eagle CAD and teaching the basic functions on the PCB aspect of it. Thank you. .How i set the sizes.